Rava Dosa is my kids favourite, at home or at restaurant they usually orders this. But he doesn't like curry leaves in it. So I do not add them first once they finish eating then I add curry leaves as I love it in dosa. Try this delicious dosa. Mix all the ingredients in a vessel to butter milk consistency. Leave it for 1 hour. Heat a non stick tawa/skillet, slowly pour the batter from side on hot tawa, you may not be able to spread like normal dosa. 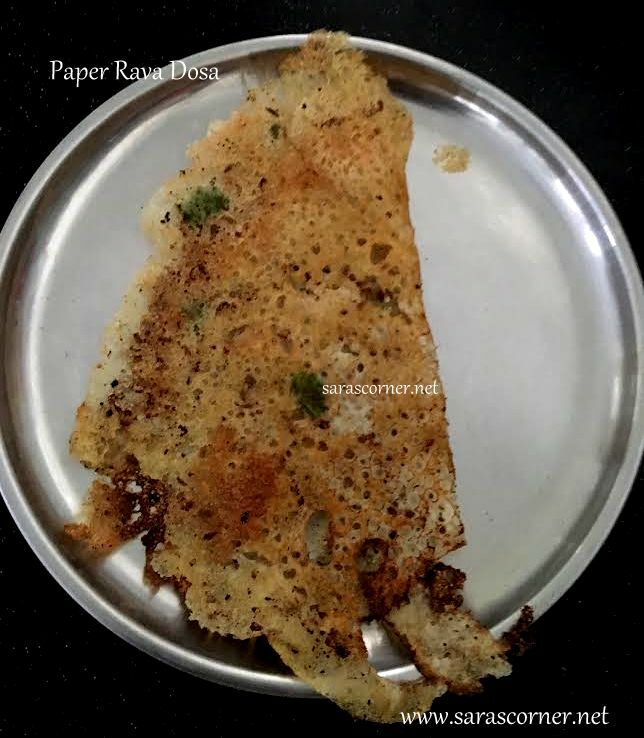 Paper Rava Dosa is ready to serve. Serve hot with any choice of chutney. - You can mix night and keep the batter in fridge for morning breakfast or mix morning for making for afternoon tiffin. - Instant also can make dosa but advise batter prepared in advance to get delicious dosa. Thanks for sharing. Will try this soon.